If it seems like any Intrepid Apparel conversation from me manages to include thoughts on the fit and sizing that’s probably just co-incidence. The main reason is probably that this Classic Race jersey, in common with the Campaign shorts, are intended for some armoured up downhill action, so the sizing is on the generous side. If like me you’re not really into that sort of thing, just size down from your usual choice, as this jersey has plenty to tempt the more Enduro/XC oriented rider. As it is, my svelte frame is often to be seen draped in the medium sized Race jersey as that’s what Intrepid were kind enough to send me. Despite it being loose enough for me to be comprehensively padded underneath without making it too obvious, it’s been one of my favourite jerseys over the past year – well, the three winter months at least. 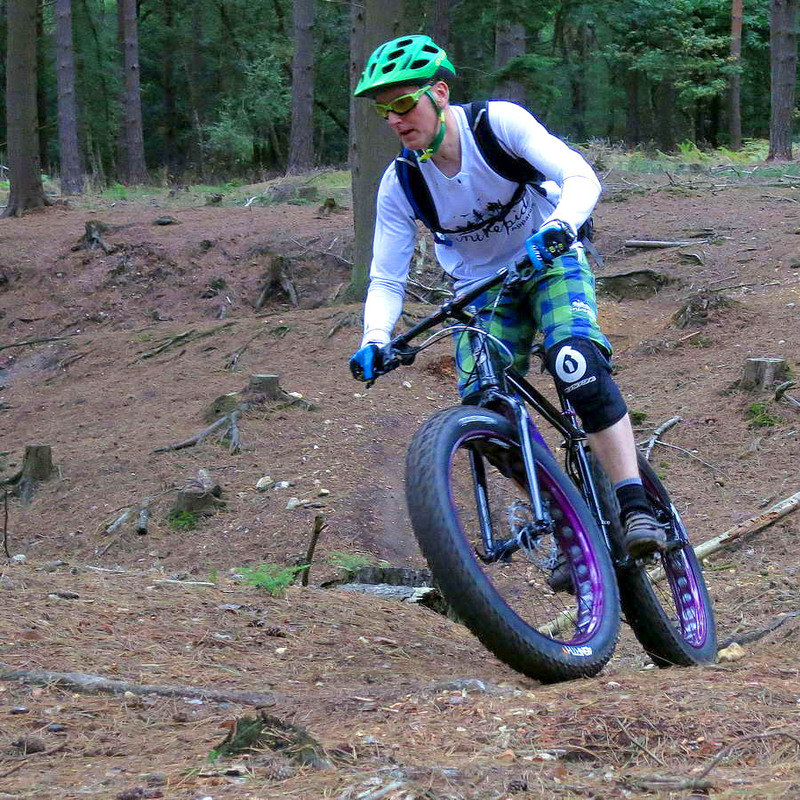 Being long sleeved, summer is not really the time for sporting the Classic in the Surrey Hills (up a mountain might be different), with the loose cut making all that wicking that others manufacturers big up rather unlikely. Come the sharp days of autumn and spring or mild winter weather this jersey comes into it’s own, or can easily be teamed with a base layer. So much so that for the warmer parts of last winter I found this long sleeved top and base layer all I really needed. The material it’s made from has a pronounced waffle effect to it that actually does wick sweat rather well when in contact with skin. It’s slightly thicker than a normal cycle shirt (though not nearly as dense as Endura’s uncomfortably hot custom MTB shirts) and this comes in handy for the stop/start nature of mountain biking, drawn out cake stops or – if you must – for those standing-around-at-the-top-of-downhill-run moments. 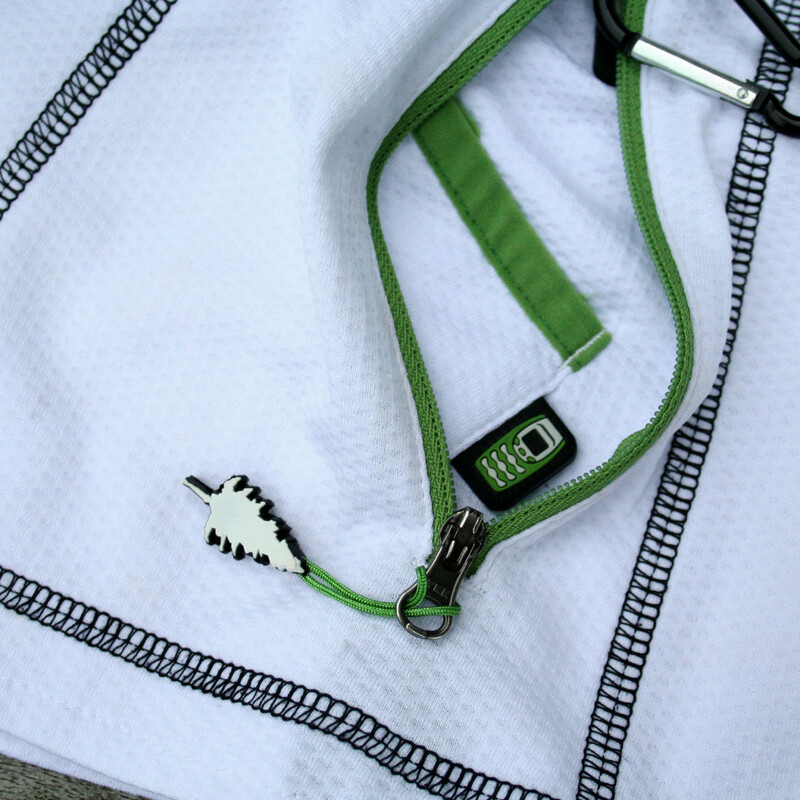 The Classic Race jersey is available in either white/black or black/white, with contrasting flat locked stitching. There’s an oversized Intrepid logo which is a rather nice woodland scene complete with Bambi on the chest and a semi V-neck to the collar. Elsewhere there’s plenty of other design touches which make teaming it with shorts from Intrepid’s range a nice exercise in coordination although it’s not so much that the jersey can’t be worn with plenty of other kit as well. 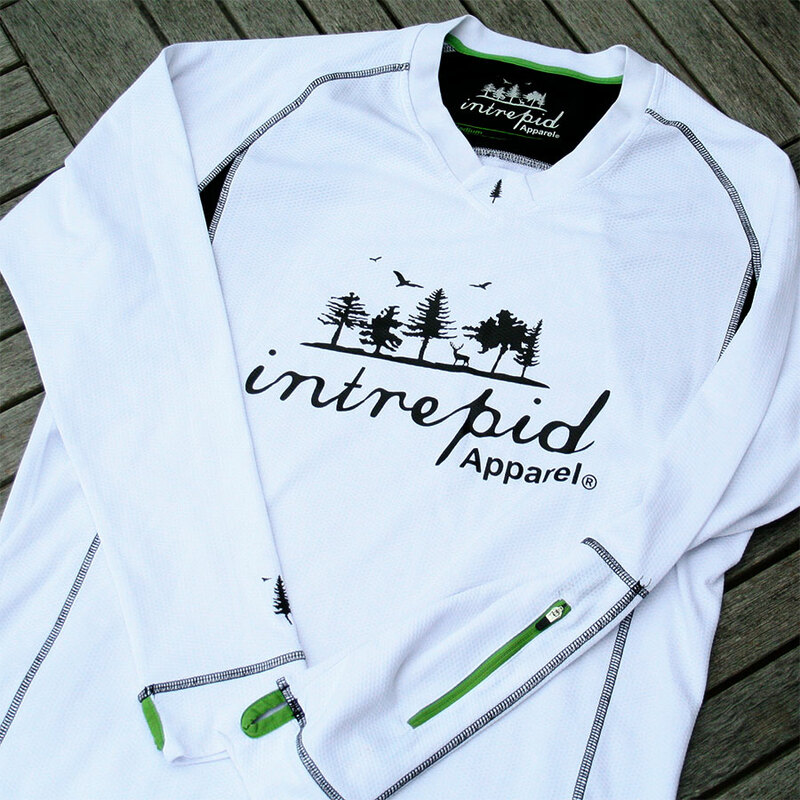 Intrepid have managed to continue their growing reputation for clever, distinctive and practical clothing with the Classic Race jersey. In addition to the visual and sizing stuff that I’ve covered, the sort of things that make this a bit different from run of the mill products include a rear pocket on the bottom right side of the hip that contains a karabiner for securing your keys, plus a small pocket for a mobile phone. This is quite stretchy but if you’re riding off-road you’re well advised to have a smaller old-school phone and SIM parked in there. In addition to the rear pocket there’s also one on your left forearm for storing bits of change or more likely a lift pass for those Alpine uplifts which is a great little feature. I use it for my remote garage key so I can have a seemless Thunderbirds moment as I roll up to the house! Neither of these pockets are waterproof but are equipped with contrasting lime green zips and zip pulls with Intrepid’s trademark fir tree motif. Be aware though that as there’s little structure to the fabric the pocket opening exercise is not an easy one-handed effort though but when you think of their intended uses you’re not likely to be trying to adjust them mid-ride. As a final touch the long sleeves have thumb loops – also picked out in contrasting green – top keep the sleeves in place. despite being quite voluminous in the main body to allow for that action man padding the sleeves snug up into quite a close fitting cut particularly round the forearms. Once again I find myself impressed with Intrepid’s quality of design, manufacture and individuality. In a year’s use the jersey has held up well – I worried needlessly that the white would embrace the mud too easily – and looks great teamed with either the Campaign or Mission shorts. Another strong recommendation from me. You might also be interested in reading my Intrepid Apparel Campaign shorts review, or you can view our Intrepid Apparel set on Flickr.